Fragments is a specialty supplier of restoration hardware including door, window and cabinet hardware, lighting, doors, electrical switches, bathroom fittings and tapware, pressed tin and fireplaces. We also have a contemporary kitchen and cabinet hardware range. 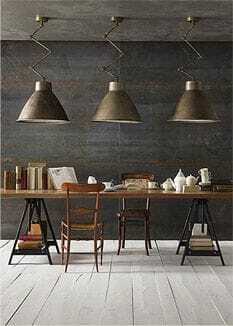 We are a distributor of the wonderful Porter's Paints & Wallpaper and sell Mokum and James Dunlop wallpapers as well. In more recent times we've introduced a range of beautiful homewares including cushions, draught excluders and door stops made exclusively for us. We sell the range of Italian light fittings from Il Fanale and Favel and the French light fittings from Terre D'Hautaniboul. Unfortunately we only have a small selection online but you can visit www.lightco.com.au to see the full range available or come into our Hobart store and browse through their catalogues. We now also sell the environmentally-friendly bio ethanol fires from EcoSmart including the wonderful VB2 that is designed to go into traditional cast iron fire inserts. See www.ecosmartfire.com for details of these beautiful fires. Fragments has been trading in Hobart, Tasmania for more than 30 years so you can be confident that we will be around for a long time to come offering wonderful cabinet & other restoration hardware. We are passionate about renovating and building. We love furniture too - both old and new - and can supply quality hardware, paints, waxes and Howard Products to finish off (or bring back to life) a special piece. We also sell individual furniture made from recycled and salvaged timbers. This beautiful range of handcrafted furniture is created in the design studio of Chris Blandford in the hills of southern Tasmania and is available exclusively through Fragments. We are very pleased to be able to offer some of our extensive range of products online. At this stage some items such as cast iron fireplaces will only be available from our Hobart shop, however, if you call or email us we may be able to arrange delivery to you within Australia. We welcome you to the Fragments website and trust you'll enjoy shopping with us.